Over the past several weeks, I’ve been briefed by a number of text analytics vendors and companies in partnership with text analytics vendors about syndicated services that make use of text analytics. Of course, syndicated services such as brand monitoring and news services that make use this technology to some degree have been around for a while. But, how about some of the newer services? An interesting example of this is illumin8, which is being offered by Elsevier, in partnership with Netbase. The service is targeted at R&D knowledge workers looking to solve technical and business problems. According to Elsevier, knowledge workers spend more time per week trying to discover relevant content relating to a particular problem area than analyzing that information (5.5 hours/week accessing vs. 4.7 hours/week analyzing). These workers are usually using a google-like search engine. I think everyone can agree that the google-like search engine is not ideal for research purposes, so I won’t belabor the point here. In the case of the R&D knowledge worker, often one goal is to gather information relating to a particular problem, finding products that solve that problem, as well as understanding the approach used to solve the problem. Here is a screen shot of what an end-user might see using this service. 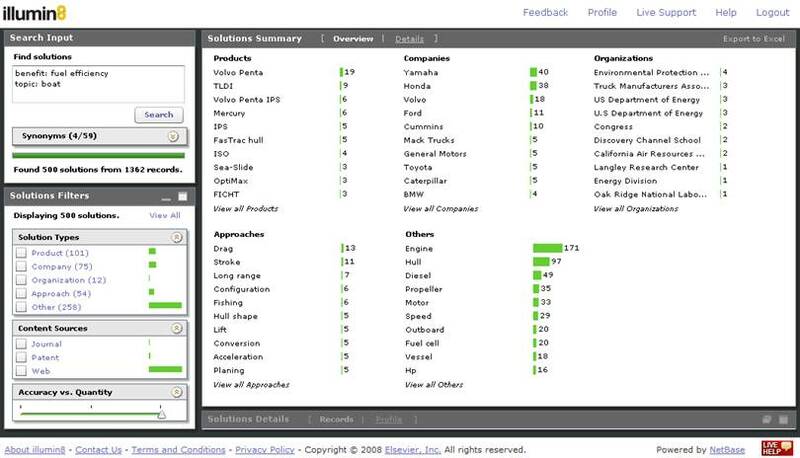 In this example, the user is interested in solving the problem of fuel efficiency in boats. He or she wants to see what products and approaches are out on the market to address this problem and what companies are providing these solutions. The user enters the topic (boats) and the benefit (fuel efficiency) in the search box and gets back information that is organized in a logical way. In this example, you can see that query returns information about products that address the problem as well as the companies that make the products, organizations that deal with energy, as well approaches to solving the problem (drag, stroke, etc). These are ranked. Users can then drill down on any of these areas to get snippets (and full text) associated with areas that he/she is interested in analyzing. During the demo, I asked to see what would happen if we input “text analytics” as the problem space in the search box. I was actually impressed that what was returned was a good set of information about the players, organizations dealing with text analytics and other information about it. The service is not inexpensive, but it does cull a lot of information. I believe that the number of syndicated services using text analytics will continue to grow. We’re certainly seeing action in the brand monitoring space on this front. Vendors are also getting into the act. Expert System, for example, has its own service that is targeted at the auto industry. I believe that other vendors may get into the act if they determine that the financial benefits of offering syndicated services (as opposed to SaaS offerings) makes sense.